Now THAT'S what I am talking about! What a great example of that bottle! It would be the finest example that I have seen, with a super strike, and wicked color. This post, and Andrew's, as well as Lou's whiskey dig are what it is all about to me. I got excited to get out and dig by reading these digging posts.The context of Andrew's especially is incredible, and hopefully others will follow suit. Thanks ! Fantastic bottle, must have been a thrill to hold it up to the sky and realize it wasn't amber ! Like ME said, look at that prefect combo of both color and strike. What do you think an approximate count on yellow and green variant 1 and 2 circle Cutters is ???? 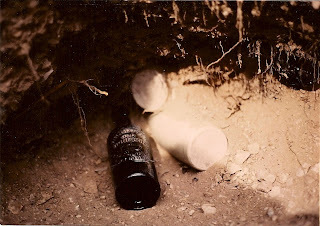 Beautiful bottle Soleagent and what a thrill it must of been to dig it yourself! I get just as excited now as I did 37 years ago when I dug my first one of these. Although some diggers may consider this bottle common they should ask themselves how many pits contained intact examples in relation to the number of holes they've dug??? To say there are 300-400 out there is an extremely low amount in a collectors field for any type of collectible. Certainly these are not as rare as some 5ths but common, I don't think so. Yes, I've dug my share of these but I've also dug thousands of holes in some of the most prolific areas these come from over a 40 year period and can tell you that they just don't come up that often. I've probably only found intact examples in less than a dozen pits in all those years of aggressively digging and in my book that's some awfully low odds. I'll tell you, those plain reverse Circles dont come out of the ground like people think. Most people think us Cali diggers are pulling them out left and right. Not true.... most of us have only dug a handful of them. They are far rarer than the many versions of the A No 1. Like AP says, the first variant is the toughest to find, but the next 4-pc with A No 1 of the reverse turns up far more often and in numbers. Not a Circle, but I dug a "convertible" OK on Saturday. Super gnarly and whittled, but the neck was gone just above the shoulder. The neck and top were not in the pit, so the jug must've been tossed in that condition. It's in the "crier" bucket. Not only are they hard to find but also consider this; Most people are clueless and take it for granite as to just what it takes in addition to the amount of knowledge, labor & time involved to even dig something like this, unless by chance they get extremely lucky. There's a ton of factors and skill that go into being able to dig any glob top whiskey, unless of course you get very lucky. Not trying to discourage anyone here but the reality of it is that the chances of a novice digging an early four mold circle Cutter are about as good as them winning the lottery. Wow, now I understand why some of the people visiting this site are calling the bloggers here snobby and uppity. Calling most people "clueless" and saying their chances of digging a western fifth are "about as good as winning the lottery" sure isn't helping our hobby. Sure hope you "super diggers" don't hurt your arm patting yourself on the back. Oh gosh G.O. I feel so bad now, here let me grab my box of Kleenex, blow my noise and wipe the tears from my eyes, there that's better. Hope I didn't discourage the two new guys digging for months in that 1930s dump up North, keep going boys...... "Most people" meaning the general population is clueless as to what it takes, not specifically bottle diggers, ohhhhh crap there I go again. Maybe that was a little harsh about winning the Lottery but that's even what it feels like my odds often are, it isn't easy. It's kinda funny too the reactions I've gotten from people over the years asking to dig bottles on their property. I'd say 95% of the time they have no idea anything like a privy or bottles could even be on their property. OldCutters; Maybe you need to buy Lotto tickets next time you dig a good 5th, you aint no novice son! I agree with GP, most of the non-diggers I've taken digging with me are clueless. They think it's just grabbing a shovel... and if you dig a big enough or deep enough hole, you just have to find some good bottles !